One of the favorite things that I love to send family that lives out of town are delicious gift baskets filled with gourmet food and beverages. Harry & David is a great resource for this, especially during the holidays! Their gift baskets and gourmet foods are perfect for entertaining, gift giving, and your holiday menus. Harry & David now offers a wine club, wine, cheese, and fruit club, Moose Munch club, and more. 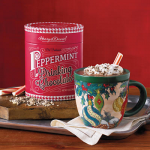 Their gifts include delicious goodies as well as a keepsake container.